The process of selling your Sacramento property can seem overwhelming. While we all wish that it was as easy as posting a sign in the front yard and calling a real estate agent, the truth is that selling your home can be a lengthy and costly proposition. It can be especially troublesome if you can’t sell your house but you still need to move. If you are relocating and need to sell your house quickly, we will give you a written cash offer, for a fair price so you can get on with your life. I understand if you might wonder if it’s really in your best financial interest for you to sell your home to us. Let’s explore some of the financial costs of selling your Sacramento home the traditional way and see if our proven method to sell your home fast makes sense for you. Of course you already know about real estate commissions. They range from the discount brokerage who might charge only 4% up to full service agents that claim 6%. Included in these fees are all the marketing plans needed to effectively give your home exposure. While traditional marketing can be effective, you are still relying on market health, inventory and buyer’s interest to bring that offer to the table. This can cost you valuable time which you may not have if you are relocating. If you’re relocating and need to sell your Sacramento house quickly, that time can result in unexpected costs. You might have several months of extra mortgage payments on a home you’ve already decided to sell. Give us a chance to give you a fair, written cash offer this week. We save you valuable time and money. Selling your Sacramento home the traditional way opens up other possible costs. Most buyers ask for a termite report. Then their bank will probably want to see the report and their bank may require repairs. This can take thousands from your bottom line even if the damage is slight. A full tenting of the home for termites can be several thousand dollars more. A buyer’s agent will insist that the buyer have a home inspection. This might result in a request for additional repairs and again cost you money even before you have sold the house. Of course you can refuse these requests, but if the buyer cancels the transaction, you are back to square one. And there’s no guarantee that if you make the expensive repairs, that the buyer still won’t walk away. We will make you a fair, written, cash offer for your home in its current condition, whatever that may be. If you’re relocating and need to sell your Sacramento home quickly, you’ll know that our cash offer is solid and there will be no unexpected costs during escrow. There are other subtle costs to listing your home on the market. Whereas we will offer you cash for your Sacramento home, other buyers may not. We buy houses fast. Their offers are subject to financing which can result in delays due to lender requirements, lender required repairs and appraisal issues. Furthermore, most government backed loans require the appraiser to reinspect your home after you have made the repairs to make sure they are done. As such, many agents and sellers feel like the appraiser is holding them hostage over repairs. Every delay can cost you additional monthly expenses. These can include your mortgage payment, insurance, utilities, gardeners, pool services, etc. Furthermore, if you house is vacant, most insurance policies will not cover any vandalism to your home. We are the best way to sell your Sacramento home fast for cash. Relocating Need To Sell My House! When you’re relocating, you often don’t have the luxury of time. 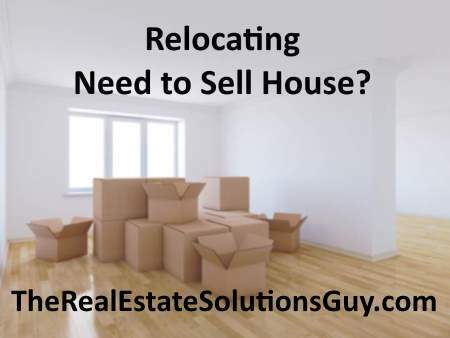 If you’re relocating and need to sell your Sacramento home quickly, the traditional way has too many variables. This can add up to thousands of dollars, and reduce your proceeds. We buy houses fast and we will give you a straight forward offer with no surprises. You can sell your home without the guess work and uncertainty. This program is not just for sellers who are in distress, but for any Sacramento seller that wants to sell their home for a fair, cash price. Give us a call to discuss your unique situation. We can give you a fair, written, cash offer within 24 hours and close in a little as 7 days.